Yesterday begreen made a detailed post here about the U.S. Senate subcommittee hearing on wildfires in Las Vegas. Here is the first article I found about the testimony. Climate Change Likely to Increase Fires from Invasive weeds. Associated Press. By Kathleen Hennessey. Related story. Sagebrush recovery efforts under way. By Emily Simnitt. Idaho Statesman. 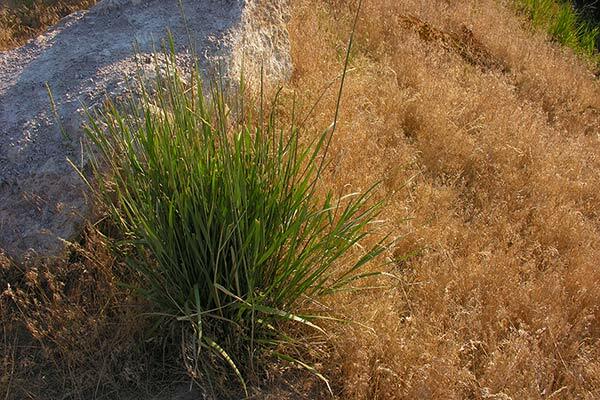 Cheatgrass is indeed a problem. I explored this issue while on a field trip for a range restoration course through the border region of Idaho/Oregon from Hell’s Canyon to Juniper Mountain. Cheatgrass was everywhere; but not as pervasive in some places as in others. Regions typically overgrazed or suffering some other human disturbance had the most cheatgrass. But one thing I did notice is that cheatgrass was lower on the grazed sides of fences than on, say, the highway side or other ungrazed side. So, while the cause of cheatgrass invasion may have been partially caused by overgrazing (not grazing itself), the solution, it would appear, is grazing. In fact, grazing of cheatgrass in its phenological peak is probably the easist and most effective means of control. I am convinced this will be the finding of the Murphy Complex study. I thought about and discussed many methods of control; and it all came back to grazing as the best control; probably using sheep in the early season on the cheatgrass, then following with livestock after the native bunchgrasses establish later in the season. A multiple front methodology is really needed to properly control cheatgrass; but there is also the ever increasing notion that cheatgrass is here to stay and we’ll just have to deal with it. In examining a state-transition model of sagebrush step, as is typical in the region we visited, at least south of Hell’s Canyon; cheatgrass is dangerous if not controlled. It increases biomass allowing for more intense fires which can be highly detrimental to both sage and bunchgrasses. The danger is we could see entire sagebrush step lost. This is probably what happened in places due to lack of grazing in the murphy complex. No, I don’t agree that WWP is to blame; but it will demonstrate that grazing is a tool that we need to use for such things as control of cheatgrass. Its much like the two-party system we have in America. We got stuck with it a long time ago; and we really can’t do anything about it, so we have to play along and live with it. Ross Perot demonstrated this when votes for him were diverted from democratic candidates. Extreme measures, while seeming to be promising, are often worse. I dearly wish that WWP would work to help promote better grazing practices, rather than trying to eliminate grazing altogether. Eliminating grazing isn’t going to solve things; it will in fact make them worse. What really needs to happen is to concentrate on proper management of grazing. I dearly hope I can count of WWPs support for legislation to require allotments be properly funded for management before they can be used. This will be far more effective, and have a much more immediate positive effect that slowly buying up grazing allotments. I just saw Old Faithful erupt from the webcam on your page. That was so cool! Hey Cousin Ralph! I’m coming to visit my dad at Thanksgiving. Hope you’ll be visiting your mom! Dear cousin, We will come down to Utah to visit. I have enjoyed seeing you dad. Thanks for posting! Everybody should check out your photographs . . . fine work! I love those Texas storm cloud photos! Mack: I will no longer be addressing others who post here. It really does not good. You are just looking for a fight, and you seem incapable of listening to reason. Why would I want to try to explain something to someone who will never change their mind. I put you and others like you in the same category of anti-wolf people: your mind will never change; so in order to wait for your extreme views to fade, we must wait for you to die, plain and simple. Extreme ideas on either side are as set in stone as they are unrealistic. I will not embrace such ideas, nor will I have discussions with people whose minds are already made up. The information I post is for those who seek out knowledge. They are my opinions, my ideas, and are based in fact and on years and years of research and careful thought. I don’t just read someone else’s ideas and adopt them for myself. To do so would make me just as bad as say, members of the Idaho Antiwolf Coalition, wouldn’t it? If you’ll no longer be addressing other who post here, I suppose you’ll be expounding and pontificating, sharing your vast knowledge, using this blog/forum as your own private soap box. Now what kind of community does that create? “…to wait for your extreme views to fade, we must wait for you to die, plain and simple.” Why, I wasn’t aware my views were extreme…! Can you offer an example? Besides, you should be aware that views, extreme or not, are frequently passed from generation to generation. And I am not looking for a fight; I simply enjoy shooting down BS. Again, I encourage you to elaborate on what you wrote “Eliminating grazing isn’t going to solve things; it will in fact make them worse.” I think you’re backpedaling. We await your elaboration with baited breath. HA…! (Hey, I love sardines) – SAP, I am aware of useage – apparantly my attempt at tying in with the baiting of wildlife has failed miserably…!